Looking for Night missions for Area 2? Click [Here]. Area 2, compared to Area 1 where it was relatively easy to achieve S-Rank, has larger map size and numerous enemy units appear. Additionally enemy controlled helipad now brings in reinforcement units that needs to be taken care of or your squad risks running out of bullets and failing the mission. So unless you are comfortable with manual resupply, turn on the automatic supply option during the S-Rank mission until you can manage it comfortably. Again since enemy units’ movement is random, always leave one battle worth of bullet for your squad when you end your turn. For finishing 2-4E [emergency difficulty] you will require recommended minimum squad strength of 4000. Again this is so to minimize the T-doll link losses and prevent being disqualified for S-rank due to having to either withdraw or heal units mid-mission. One tip to prevent such loss is individually retreating T-dolls during the battle which prevents further damage to the unit. [Squad will still retain formation bonus]. S-Rank condition: Kill 4 unit in 3 turns; control enemy HQ. Turn 2: Put down 2nd squad on HQ. Turn 3: Control enemy HQ and use 2nd squad to fill the kill condition if need be with extra moves. Turn 1: move 1st squad 1 ahead and call in 2nd squad. End turn. S-Rank condition: Kill 8 unit in 6 turns; control enemy HQ. Turn 3: use squad on HQ to occupy enemy HQ while meeting kill requirement on the way if possible. 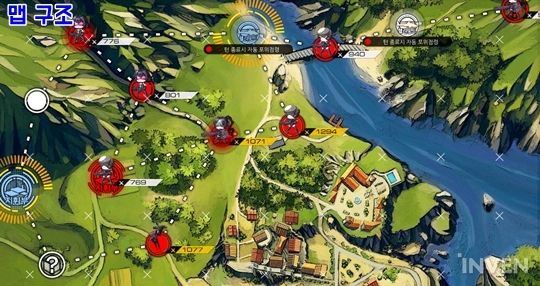 Avoid occupying enemy helipad on Top right and center to let more enemy units to spawn. Turn 1: Summon 2nd squad on the helipad after moving 1st squad down one. Turn 4: use both squads to meet the kill requirements before moving to occupy enemy HQ. Turn 1: Summon 2nd squad on the helipad after moving 1st squad up one. Turn 3: use both squads to meet the kill requirements before moving to occupy enemy HQ. S-Rank condition: Kill 8 unit in 5 turns; control enemy HQ. Turn 3~5: meet kill requirement then occupy enemy HQ. Turn 3: use extra movement if necessary to meet kill requirement before occupying enemy HQ. Turn 1: deploy 2nd squad on HQ after moving 1st squad down 1. Turn 1: Deploy 2nd squad after moving 1st squad up one. Turn 2~3: Meet kill requirement then occupy enemy HQ. Turn 4~5: Meet kill requirement then occupy enemy HQ. DO NOT LET AREA BOSS TO OCCUPY FRIENDLY HQ if going to turn 5.